The business organizations in United Arab Emirates are now more focused and attentive about the new developments in the business environments. They want to upgrade their internal systems in such a way that they can manage all the business operations in a systematic way. SAP Business One helps these organizations in all forms, whether these are small, medium or large. We, at BTC, have such a team which can implement SAP Business One in UAE properly to satisfy the customers all the way. 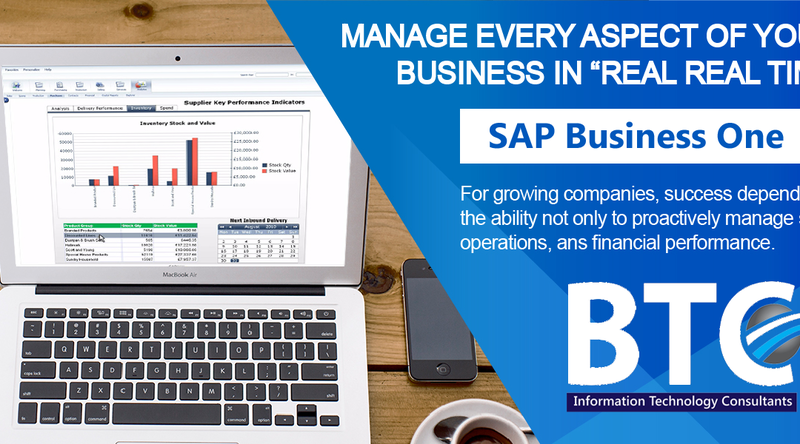 The general trend in the world is that people establish their business in the first attempt and when they think that they have started profit generation, they ask for business solutions, but now, people have developed their minds and implement SAP Business One to develop their business on strong basis to compete the existing companies in the market. It is quite a difficult task to give information about the implementation procedure of SAP Business One in UAE. we want to give you some basic information through which this system is implemented in a new organization. For newer companies, it is very important for the service providers to get to know the equipment cost as it is a part of fixed assets of the organization. It is also important to gather the expense transactions as well for the current year. If you have minimal information, you will adopt these types of approaches for developing a proper implementing process. The next step is the recording of business transactions through the general entry system which are related directly to loan draws and cash. The invoices of all these transactions will also be recorded to make sure that everything is in the system. The next step in recording is the find out accounts payables and review the outgoing payments as well. After recording all these transactions, the closing of accounts is required, which is an important part to reach at the financial statements of the year. If your system has been closed properly through SAP Business One in UAE, you are able to record the business transactions by yourself. With the start of sales, this system will allow you to implement the sales module as well to make your business operations fully functional. It is also important to mention that you should finalize the depreciation model as well with the implementation of SAP Business One so it will also be handled at the same time. BTC is an established SAP Business One Partners in UAE, offers a breadth of international experience implementing and integrating SAP Business One ERP software into the existing infrastructure and systems of enterprises across different sectors. Contact our team for our services.